VTech First Steps Baby Walker has a sturdy design to support and nurture baby’s first steps. The 2-in -1 sturdy walker and detachable play centre introduces letters, words, numbers, shapes, animals and colours. The play phone, moving butterfly, discs and rollers develop manipulative skills.Also features 10 nursery rhyme melodies. Styles may vary. Colourful, imaginative and action-packed this sturdy baby walker from VTech will help to support and nurture your baby’s first steps and includes a variety of activity attachments that will keep them entertained on the go. All with the added benefit of easy assembly and its small compact design, making it suitable for storing in small spaces. Features a detachable learning centre packed with activities. Sturdy design; Supports: brain power, senses, hand to eye co-ordination and physical development. General information: Batteries required: 3 x AA (not included). For ages 6 months and over. EAN: 0050803617639 Lion Mark The Lion Mark is a symbol of Toy Safety. All our toys are tested for compliance with exactly the same approved safety standard. * 3479865 19.99. Support and nurture babys first steps with the VTech First Steps Baby Walker. 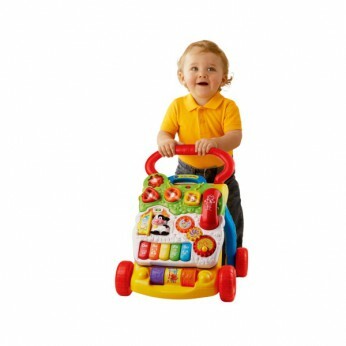 This brightly coloured Walker features a detachable learning centre packed with fun learning activities. Shapes and light-up musical keys introduce letters, words, numbers, animals, colours, sing along songs and melodies. The moving butterfly, discs and rollers develop manipulative motor skills plus a rattling role-play phone. The First Steps Baby Walker features textured wheels, easy grip handle and durable design to ensure baby gets plenty of support for taking those first steps. Assembles very easily and can be stored away in small spaces!The VTech First Steps Baby Walker is a great way for little ones to learn all about letters and numbers when on the move. This 46cm tall walker for children aged six months and up is packed with features including: Detachable learning centre packed with hands-on activities Shapes and light-up musical keys representing letters, numbers and colours Rattling role-play phone Sing along songs and melodies Moving butterly, discs and rollers to get hands on with Sturdy design to support and nurture your baby’s first steps Easy grip handle for little hands This brilliant adaptable toy can be assembled easily and folds up so you can store it away in small spaces. The walker needs 3 x AA batteries, which aren’t included. This toy costs approximately £23.99 (for the latest and best prices make sure you check our retailer list for the VTech First Steps Baby Walker above). In our review of VTech First Steps Baby Walker we classed it as being suitable for ages 0 to 11 months but recommend you check the manufacturer specific advice before purchasing.